When you want a quick, clear copy, nothing fancy, this low-cost 86 brightness paper will do the job for less. 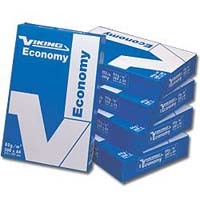 Sturdy 80gsm bond resists curling, static build-up and jamming in your copier. Saves annoying jams and downtime. Each ream is sealed in a moisture-resistant wrapper to retain freshness on the shelf.